Averroes (1126-1198) - One of the last of the great Muslim philosophers of the Middle Ages. Unlike his predecessors, he was not Middle Eastern, but Al-Andalusian (meaning from Muslim Spain). Besides philosophy, he also studied math, music, medicine, theology and a number of other subjects. The writings of Averroes reflect the dramatic change in Islamic thinking from the early philosophers (like al-Fārābī and Avicenna) up to his time. The the primary reason for the change was due to Al-Ghazali (see al-Ghazali below), who veered away from non-Islamic thought. Early Islamic philosophy espoused Greek writings and held the ancient Greeks in high regard, particularly Aristotle. 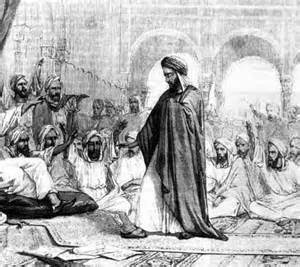 But al-Ghazali rejected Greek philosophy as heresy because it was not based on the teachings of Mohammed and, by extension, criticized the likes of al-Fārābī and Avicenna for corrupting Islamic thinking. He wrote a book called The Incoherence of the Philosophers in which he singles out Al-Fārābī and Avicenna for criticism. But Averroes was of the old school of thought. He studied Greek philosophy and defended those early Muslim philosophers. His commentaries on Aristotle and Plato's Republic are often credited with preserving the Greek philosophers' works through the Middle Ages. But his most famous book is The Incoherence of the Incoherence which was written to counter al-Ghazali. However, al-Ghazali had been so effective in his influence, that Averroes' work was not universally accepted. What had been considered standard before al-Ghazali, was now controversial. Still, he developed a considerable following and his school of Islamic thought became known as Averroism. As a European, his work also became more popular in Western Civilization than that of other Islamic writers. For this reason, Thomas Aquinas was a great admirer of Averroes.